Election Day in Natchez, Mississippi. We scurried off to the post office and mailed our ballots. We are voters! It feels good to reengage in the democratic process. Natchez has always been a great riverboat town, dating back all the way to 1811 when the first steamboat docked here. 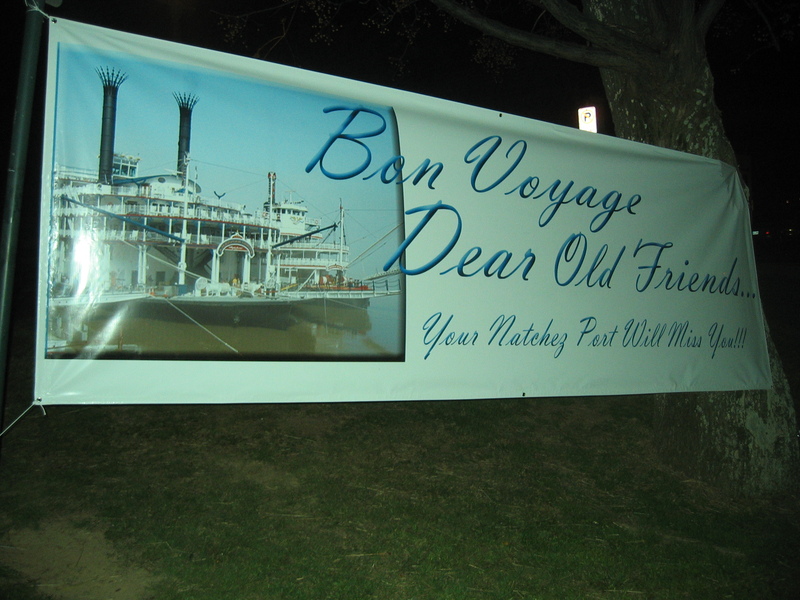 We were very touched that Natchez even produced the banner shown here as a special tribute to the relationship between the boats and the city. The good news is that Majestic has finally decided to allow American Queen guests to come aboard the Delta Queen for a visit. They had offered seven 2-hour cruises for sale at a cost of $49 each. None of them sold enough to meet the minimum to operate the trip. Somehow, people on a week-long riverboat cruise weren’t interested in paying $50 to take a two-hour riverboat cruise. But at least the company has given in and opened up the DQ for visits. I hope this will dilute some of the tensions amongst the AQ passengers this week. The Natchez casino at sunset, just behind the AQ. We had another nice event with the city representatives from Natchez. The boat is staying until 11pm, so a few of us slipped away for dinner at the incredible Kings Tavern restaurant. Terrific meal! On the way back, many steamboaters gathered at the famous Under The Hill Saloon for one last toast to the city. Supposedly, Mark Twain used to visit this historical pub when he served as a steamboat pilot before the Civil War. WE gathered here again before a dark time in steamboat history. Lovely Vicksburg. After the last two ports, it is so nice to have attractions within walking distance of the boat! Plus many are headed out on tours, most to visit the interesting Vicksburg battlefied of Civil War fame. Laura and I ascended Vicksburg’s intimidating hills to dine once more at Walnut Hills, one of our favorite restaurants. You sit at a big round table with a spinning “lazy Susan” circular disk in the middle which is quickly filled with good, hot southern cooking! Besides the terrific meal, we also owe them a big thanks. They were kind enough to allow us to have our absentee ballots mailed there. We were so excited to get them and cast our ballots, postmarked by tomorrow’s election day. It is great to be excited to vote again! The Vicksburg event went great and the mayor had some very nice words to share. Unfortunately, tensions are increasing amongst AQ guests. We are in port all day each day this cruise and so far the folks on the port side have their view blocked all day by the Delta Queen. Now, I would consider this a treat, but many do not. Not only is the view blocked, but the exhausts are loud and the diesel smell is very strong. Even worse, the docking for port except Oak Alley Plantation on the last day will keep the Delta Queen on the same side. People are getting cranky. Nerves are on edge. I know ours are. Up at the Calliope Bar a guest was complaining to Laura. (Even though we’re not staff, guests think anyone below 50 must be, so we always get plenty of feedback.) The gentlemen was so angry about the DQ situation that he said, “They should just sink it!” My sweet, tender Laura just burst into tears as he stormed away. She said later that his words felt like a knife cutting into her heart. 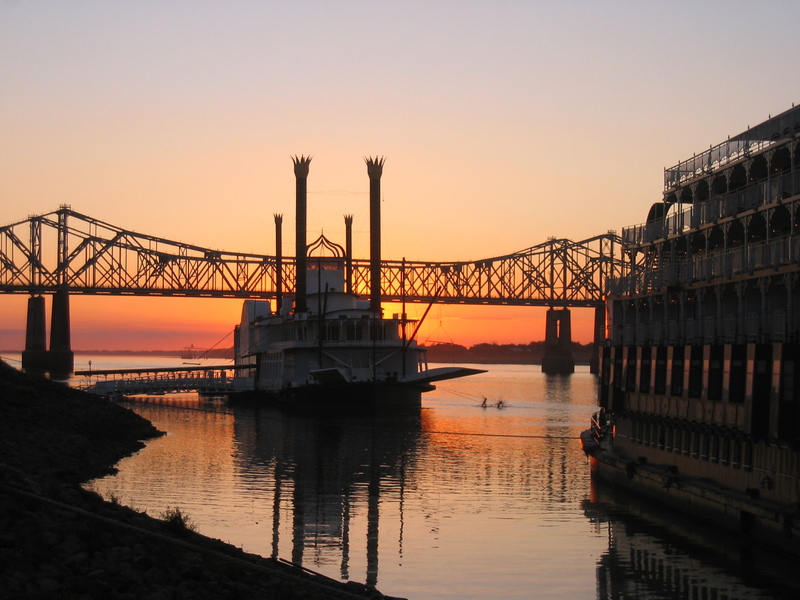 To help with the problem, after the American Queen departs, the Delta Queen will remain at Vicksburg until until very late to give the AQ port side some quiet time to sleep. The DQ will join us in Natchez in the morning.